Sambaram or Morum Vellam is Kerala style buttermilk which is spiced with curry leaves, green chillies, and ginger. It is refrigerated for a few hours before serving so that the flavours of all the ingredients seep in the buttermilk. Here is how to make Sambaram. Last year, during Onam, I was very excited to savour and experience the flavours of traditional Onam Sadya. Basically, Onam Sadya is a huge spread of vegetarian dishes served on a banana leaf. Luckily, I have a few Malayali friends who invited me for an authentic pre-Onam Sadya lunch. The simplicity of the dishes bowled me over and I was off to sample yet another Sadya at a near by Kerala Cuisine Restaurant one weekend. I came back home motivated to make a few of the traditional Sadya recipes at home and after a few discussions with friends over the phone and some research on the internet, I succeeded in making 10-12 recipes which tasted very close to what I ate at the friends place and at the restaurant. Out of all of those recipes, I particularly loved the tangy drink called Sambaram or Morum Vellam. And this summer, as I am making coolers every afternoon, I thought of making a fresh jug of Sambaram. All you need is curd and basic Indian spices for making this flavorful Onam cooler. I serve it during lunch. However, you could even serve as a cooler. 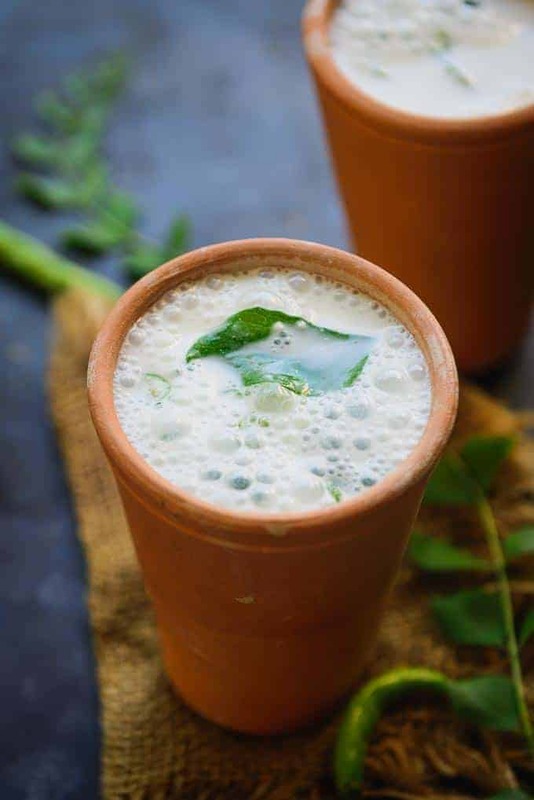 Say bye to Spiced Buttermilk for few days and fall in love with the flavours of South by making Sambaram! Get started and include the recipe for Sambaram in your food diary. Sambaram or Morum Vellam is Kerala style buttermilk which is spiced with curry leaves, green chillies, and ginger. It is refrigerated for a few hours before serving so that the flavours of all the ingredients seep in the buttermilk. Whisk curd till it is smooth and creamy. Add salt, green chilli, curry leaves and ginger in the curd mixture. Refrigerate for at least 1 hour before serving for the flavours to get infused. Neha ! 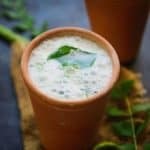 , Sambaram is also a good refreshing drink in a hot summers ..from health point of view its acidic nature fights germs and bacteria helping clear stomach and aid in digestion..